Param Patel, aged 10, won the prize for his masterful performance of the tabla – an Indian percussion instrument. Param has developed his talent at the Akshar Arts Academy run by BAPS Shri Swaminarayan Mandir, London (popularly known as the ‘Neasden Temple’). Param has performed at various cultural events in front of thousands of people at the BAPS Swaminarayan Mandir. He has also performed at an interfaith music event at the British Museum, and the Language Show in London’s Kensington Olympia. In addition to the tabla, Param also plays the guitar and keyboard. ‘Spelthorne’s Got Talent’ is a borough-wide talent contest open to all ages, endorsed by the Mayor of Spelthorne, Councillor Jean Pinkerton OBE. It is open to singers, dancers, actors, poets, musicians, comedians, artists, magicians and more. 13 finalists from the borough competed at the John Crook Theatre in Shepperton on Friday 22 March 2019. 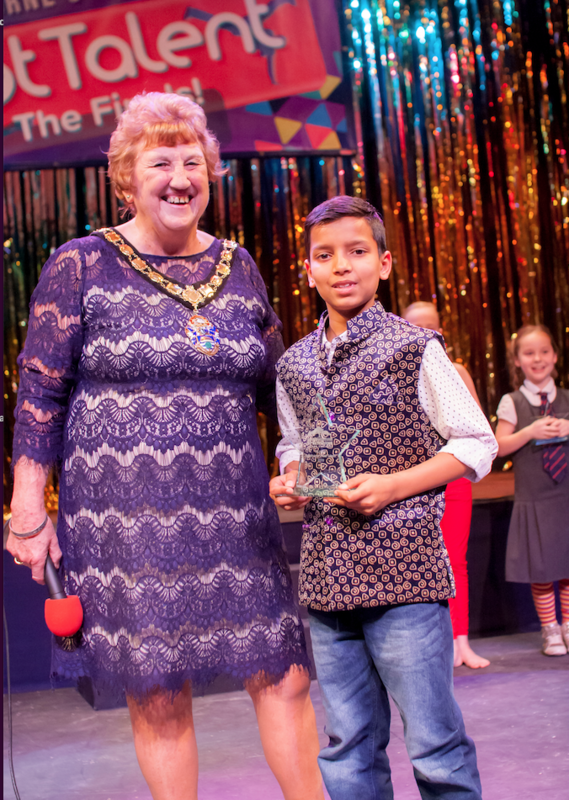 Cllr Pinkerton presented the trophy to Param, who also received a two-hour recording session at Skyline Studios and a tour of Pinewood Studios.The difficult job of picking the winners was given to a panel of judges including Nina Wadia, who have a wealth of experience in theatre, dance, music and acting.